Bobby Corbisier & Spencer Callahan are two bike mechanics from Portland who we first met on a bicycle camping trip to Stubb Stewart State Park two years ago! Since then, they embarked on a crosscountry bicycle tour, starting on established routes, but soon looking for more obscure routes they fashioned themselves. And they played a game of hot potato. 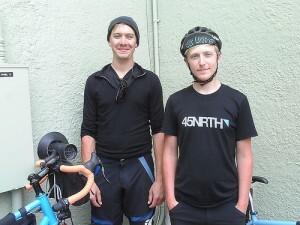 Also: Aaron shares some Mexico stories, and Brock reluctantly adopted Strava to calculate the inaccuracy of his caloric budget.